The 14th edition of 'Varuna' a 10-day naval exercise started with the arrival of four French naval ships at Goa. The exercise is aimed at further deriving mutual benefit from the experiences of the two navies and strengthening the bilateral ties between India and France. The French aircraft carrier is carrying fighter aircraft Rafale M, Strike Aircraft Super Etendard, E2C Hawkeye Airborne Warning And Control System (AWACS) -- a mobile, long-range radar surveillance and control centre for air defense -- and helicopters Dauphin and Alouette 3. India has decided to buy 36 Rafale fighter aircraft in fly-away condition for the Indian Air Force. 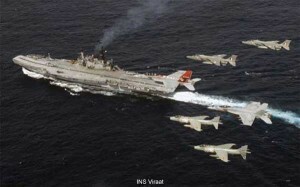 From Indian side, aircraft carrier INS Viraat, destroyer INS Mumbai, stealth frigate INS Tarkash, guided missile frigate INS Gomati, replenishment tanker INS Deepak, submarine INS Shankul and a few Fast Attack Craft are participating in the exercise. Both INS Mumbai and INS Tarkash had recently come back after completing the evacuation operation in Yemen.